What to do if you want to do some track days on your sport-bike, or if you want to try your hand at racing? If you get serious about these pursuits, you are ultimately going to want to get a set of racing plastics. Track bodywork alleviates all of the glass and lighting plastics that you don't want on the track, all the while reducing weight. Armour Bodies Bodywork is a great place to start your search for race plastics. The company offers plastics for most popular sport-bikes. Armor Bodies is made with a unique resin derived from the kayak racing industry. The theory is obvious: kayaks spend their lives bouncing off rocks; race bikes spend theirs bouncing off other bikes, and occasionally the tarmac. Another benefit of this bodywork is that it is fully prepped for paint. With just a light scuffing, you are ready to spray. 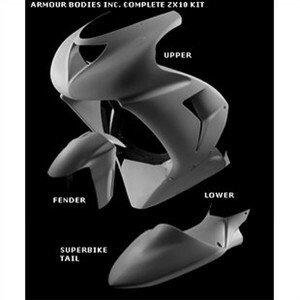 So in the end, Armour Bodies Bodywork is a solid option for your race bike conversion. Just remember that any aftermarket bodywork set can be a challenge to fit. Most any handy shade tree mechanic can do it, but it can be tricky. So there you go -- fit on some racing plastic and start scraping some pegs! Click here to find this kit on Revzilla.com.